The perfect way to start your spring meal at W5. Made with a rich truffle butter sauce, the softness of blanched asparagus pairs perfectly with the fried egg. Served room temperature and sprinkled with truffle peelings and white truffle oil this is a delightfully rich dish. A beautifully light starter – the sea trout is cured in sugar, salt and soft herbs. It is aromatic, floral and extremely effervescent. The sea trout is gently blowtorched to create a bittersweet flavour and the Oyster leaf is mayonnaise perfectly compliments the fish. Served with zesty and refreshing cucumber and gin salsa on the side which adds an exotic and refreshing element which is a delightful pairing with rich fish. The ethereal version of a sloppy joe – the veal ragu is cooked with red wine and vegetables, an ensemble of tomatoes and carrots. Charred onion pestles sit atop the dish creating a bitter sweet taste. Served with a milk bun on the side which is marinated in bone marrow butter. A casual dish that exhibits the best of British produce. The boneless chicken thigh is confited in duck fat which breaks it down exquisitely. Soft and tender – it positively dissolves in your mouth! The skin is crispy and goes perfectly. Dressed in baby gem almond yoghurt which is delicately spicy and fresh, this delightfully light dish is a nice, warm spring starter for all the family. An exquisitely refreshing salad. 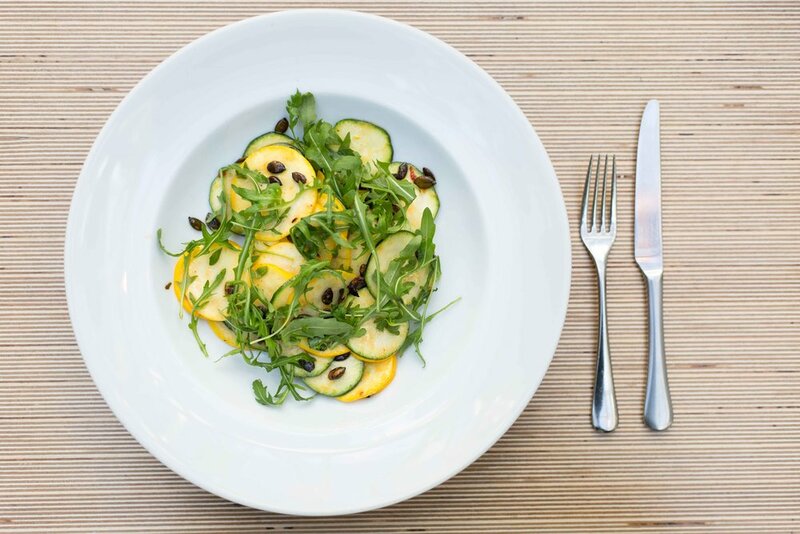 The yellow and green courgette is thinly sliced and dressed in a lemon and chilli vinaigrette. The acid from the lemon break down the texture of the courgettes so they are not too crunchy. Bursting with fresh herbs, fresh raw chilli, toasted pumpkin seeds, which add a lovely crunch, it is an explosion of fresh tastes. 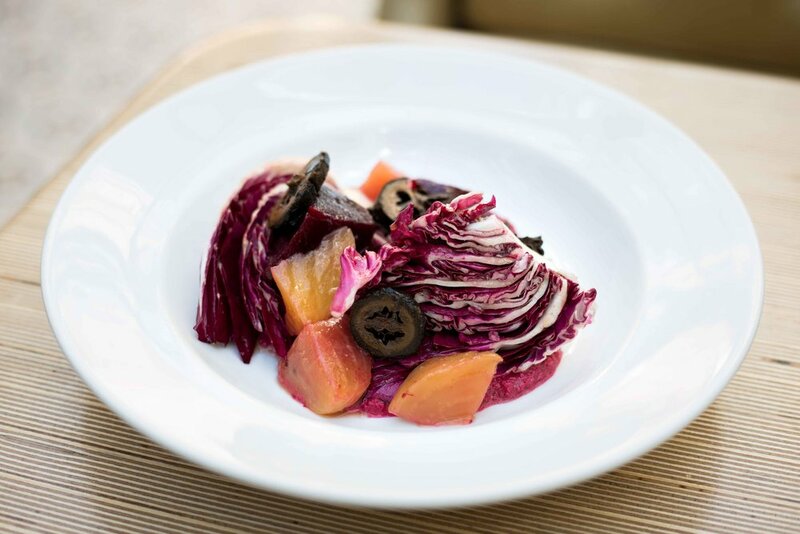 A base of a beetroot hummus made from roasted beetroots dressed in a sherry vinaigrette frames the dish. The pickled walnuts are sliced and add a great acidity to natural sweetness of the earthy beetroot. The Cauliflower is roasted in harissa butter and served with a risotto style of toasted freekeh with poached raisins and apricot slices which add a delicious sweetness to the dish. It is light and spicy with a fantastic combination of textures and it can be made vegan without the harissa butter. The roasted rump is of a lovely lean cut – cooked medium to well done and is served with a crispy tail on the side to add extra crunch. A bed of sweet and sour carrots frame the dish adding a lovely soft texture to compliment the tender pork and the crunchy tail. Raw pear brings an element of freshness to the dish and the Ealing honey brings the whole dish together. Deep fried, and filled with herbs, these exquisite ricotta dumplings provide a rich backdrop to the scattering of seasonal and light spring vegetables. The courgette peas are lightly dressed in vinaigrette and the tomatoes, which our head chef describes as the ‘finest from the isle of white’ bring an acidity and a freshness to the dish. This creamy, heart-warming dish is an explosion of tastes and textures. The wing is baked on the bone with brown butter and garnishes in buttered, chard rainbow leaves to create a delicate crunch. 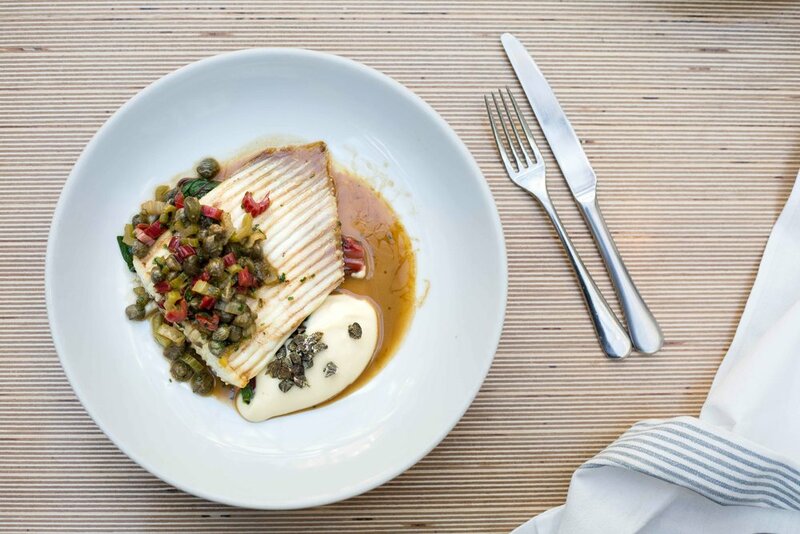 A deliciously sour and creamy wild caper sauce encompasses the stork – it is made with tiny wild capers, dilled pickle and chives and the zestiness of the sauce compliments the creaminess of the cauliflower puree beautifully. A seasonal delight. The rhubarb is grown outdoors and due to its seasonality, the colour isn’t pink – it is a more heritage and homely vegetable. 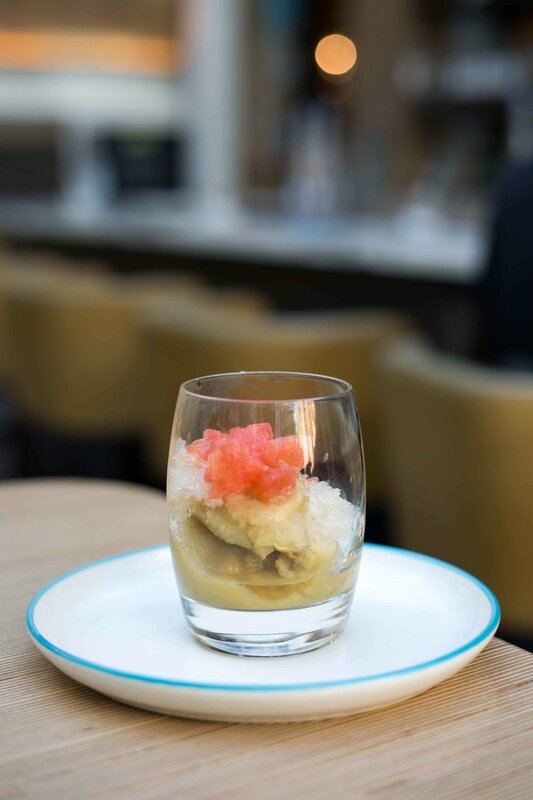 A delicious granita made from elderflower wine and a few pink grapefruit segments brings a sweet bitterness to the dish.